There is something so satisfying about pie. I began my love affair with it as a young child who frequented Marie Calendar’s. Remember Marie Calendar’s? Or Baker’s Square? I think there are a few of them left scattered about the suburbs. I remember the excitement I had when I knew we were going to pick up a whole pie or even a few slices. Pumpkin, apple, dutch apple, strawberry, pecan – I loved them all unconditionally. If I was really lucky I got a pie all to myself – true story – and I would eat the whole thing. I loved pie so much I used to pack a slice of Marie Calendar’s strawberry (when it was in season) as a snack during recess. I currently love pie so much I shoved it into a muffin when I was too lazy to roll out some dough and bake one (see post below). 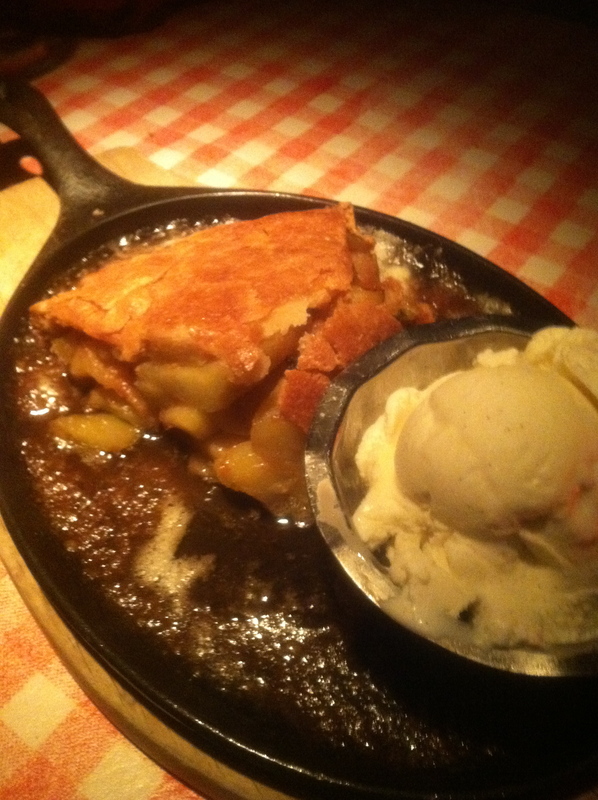 Since we’re on the subject of pie, let’s talk about the apple pie served at Jones restaurant in Hollywood. I have to be honest, I would have never thought of Jones as a place to get a great slice of pie, but it is. The apple pie is served piping hot on a cast iron skillet atop a sea of molten caramel. The apples practically ooze out of the flaky, crisp pie dough. They are wonderfully soft and sweet and the crust is perfectly buttery, but what puts this over the top is that salty rich caramel – it is liquid gold. Everything is right about this pie. It tastes like it came out fresh from the oven. Hot apple pie is love. Leave me a comment – I would love to know where you get your favorite pie! Lynn- i like the apple pan too good pie good burgers, but i do think pie is better warm! My favorite pie is and will always be from my sister’s oven, she has a gift. Been telling her for years she should sell. This pie looks out of sight! When are we going to THE PIE HOLE?? Ahh Baker’s Square – totally forgot about that place. Good blast from the past. I don’t know where my favorite pie place is in LA but you got my itching to make an apple pie now, even though I totally agree with you – making the dough blows! Will go for pie STAT!